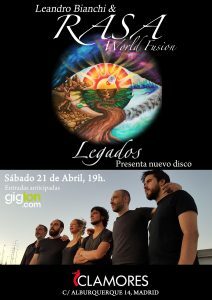 Presentation of his second album “LEGADOS” a new work full of colors, nuances and roots of the world. RASA World Fusion is a project directed by Leandro Bianchi that achieves a unique identity influenced by Indian, Flemish, Latin American and others styles. Music, a horizon without limits … This is how Rasa feels when immersed in sound.